Outrageous comedy, exciting music and dazzling multimedia theatrics are combined to create visually stunning and hysterically funny show. Loved and renowned all over the world for their live stage shows, the Blue Man Group has now brought its unique and spontaneous performances to Orlando. Blue Man Group - Tier 2 Late eve perf. Blue Man Group - Tier 2 Early eve perf. Blue Man Group - Tier 1 Late eve perf. Blue Man Group - Tier 1 Early eve perf. Part performance art with audience participation, this show is unlike anything you've seen before. Three performers with bald, blue heads splatter paint and use every imaginable prop in this totally fun and totally unique production. 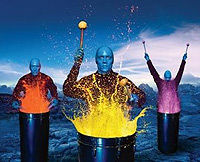 The legendary Blue Man Group will have you smiling and laughing until you are blue in the face!